The Jaguar XJS is one of Jaguar’s many remarkable models. The XJS was put on the market in the year 1975 as the replacement to the Jaguar E-Type. Though Jaguar XJS did not equal the legendary E-Type when it came to speed, it featured an aerodynamic body as well as advanced auto parts compared to its earlier model. 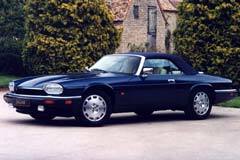 The car was known as XJ-S before it was face lifted in the year 1991 to become the XJS. Based on the shortened XJ6 chassis, Jaguar XJS is not a sports car though it successfully continued in the spirit of E-type Series. The car was a great grand touring vehicle, with the light power-assisted steering, huge gas tanks as well as high gearing. The car remained in production for over 2 decades, the longest run of any Jaguar model. It went on to become a monetary success for Jaguar. The last vehicle came off the line in 1996. 1994 Jaguar XJS Convertible 1994 JAGUAR XJS CONVERTIBLE, 4.0L 6Cyl, AUT TRANS, 89K MLS, CLEAN, NO RESERVE. 1976 Jaguar XJS This is a very early XJS in good running order and excellent appearance.